There were so many yard sales this weekend~holy moly! I had made my list and had about 12 on it, but only made it to 2 or 3 on my list because there were so many signs for ones along the way, I had to stop. 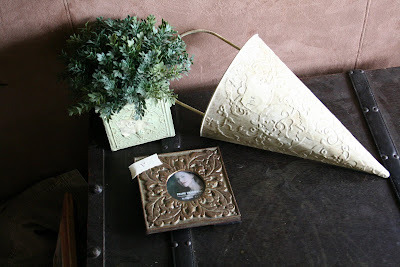 I love the doorknob hangy thingy - great finds this weekend. You found some awesome deals. I bought one of those cream hanging tins in your first photo for $7 and change and thought I did good but I like your shopping much better. All that for 18 bucks!! I absolutely LOVE the shabby chic hanger it is awesome! That doorknob hanger is too cute! 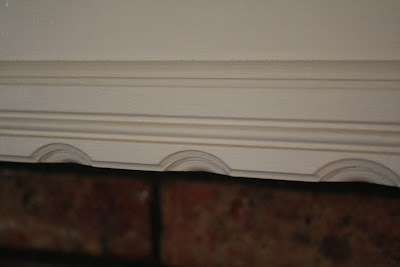 I love that it matches your trim! Great finds! Great finds! I love that orange thing with the door knobs, too! And all of the pink stuff really caught my eye, too cute! 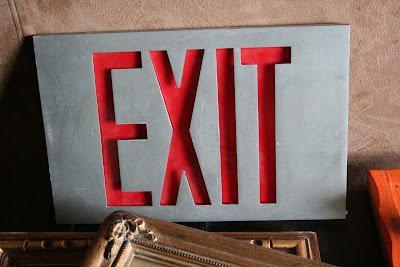 That EXIT sign is just awesome--so perfect for a boys' room! Great Deals Melissa! 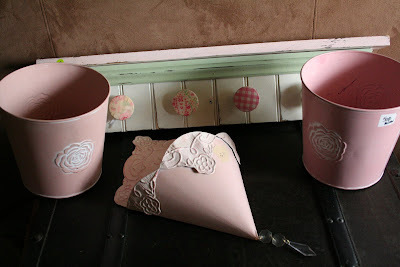 Love the hanging tins.. the pink would look great hanging on my daughters door. And that shabby chic shelf is just toooo darling! Melissa, You do find the best treasures. Love the pink items and the Exit sign! Hey Lissie! I'm excited because I hear you're going to be in Msla over Fair weekend? We are too... at the sweet KOA Missoula:) with Andrew and Sarah! We hope to catch up with you there??? Love you! AWESOME! nothing beats great finds especially all you got for 18 bones! My fav. is the girly shelf with knobs and the tins, super cute! Great finds. The Exit sign and shabby chic shelf especially. 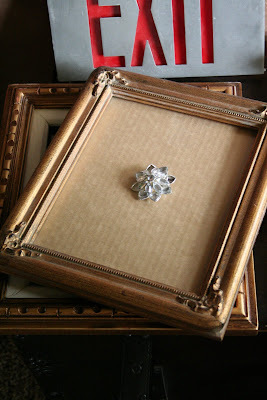 Love the frames - what great finds! Looks like you had a great day, too! I'm a sucker for frames! Good job on the finds. Am over from Rhoda's. Awesome finds! I love the hanging cream tin. 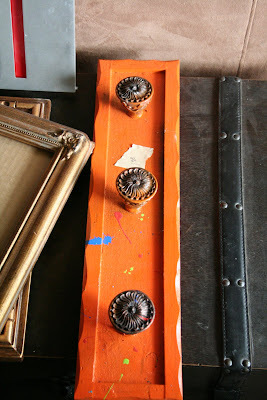 Oooh, love the orange with doorknobs ! 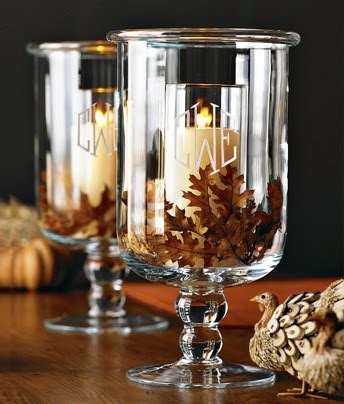 And you can never have enough cream decor ! Very impressed with your finds!! Love all that sweet pink stuff, but like you, my daughter is NOT into pink... *sigh*. Wouldn't've passed those up either, though! And those frames are gorgeous! But i'm just IN LOVE with the exit sign! My son would LOVE that!! You found some fantastic things! I love the pin! That would be so pretty in a million ways! :o) My son would flip if he saw the orange! That is his favorite color! I love all of your finds!!! I have the exact same little tin with greenery that I picked up in my favorite junk store a couple of years back! Love all your goodies! All great finds, but I think the orange hanger is my favorite. Love that edging! Great finds Melissa. I am in LOVE with that "exit" sign! I sold alot of the metal things you got when I owned a store so I KNOW you got great bargains. 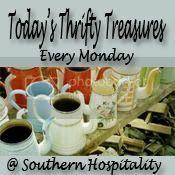 Happy Thrifty Monday. Melissa, love your finds this week too! You really did good. I know, $18 or $20 is about my limit these days too & sometimes I run out quick! Great stuff, you did good! I love everything, you have quite the eye for detail, my friend! Melissa - you are amazing. Truly! I love all of those finds. How lucky! I think the exit sign for your boys room is too cool! Never thought about that! Way to go Melissa, that's an $18 well spent. I really need to find time to get out Saturday mornings. I love all your little treasures. Hi Melissa! It is your beloved Aunt Nancy! Please, if you don't mind, invite me to your blog again. I lost all my old addresses! 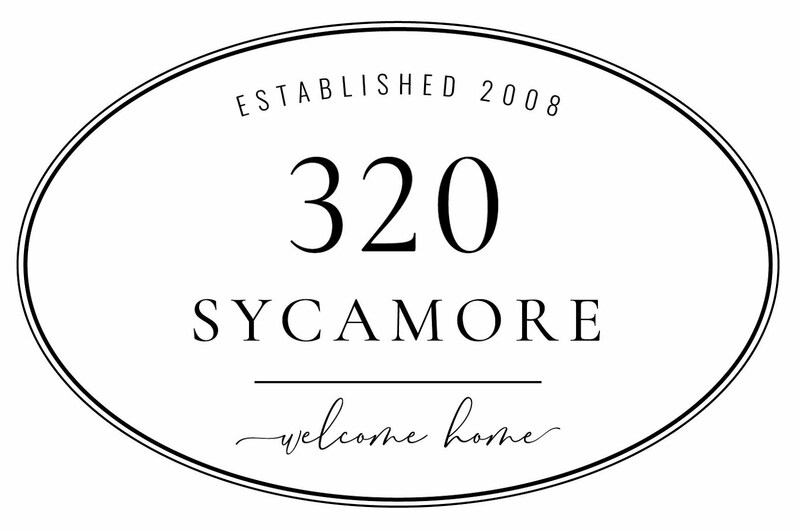 This blog (320 Sycamore) is so refreshing ! Love you guys! It will be so fun to see you and your little (actually getting pretty big family! I have a cute new grandbaby! He is really cute, but of course, I am kind of partial! I'll have Jami send a picture. She hasn't sent out anouncements yet! She doesn't quite have the hang of things yet!!! Love you guys!